I have been making and purchasing cleaners for years and both options have advantages and disadvantages. 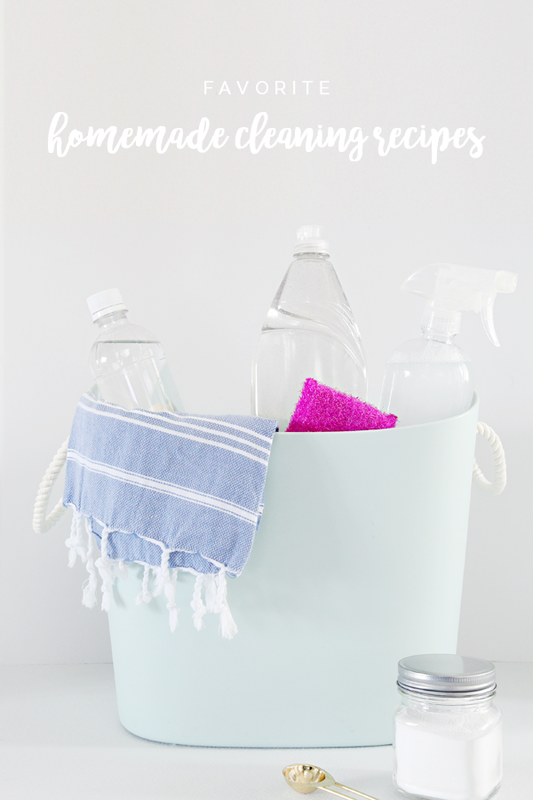 I will admit, there were times I felt my homemade cleaning recipes were too complicated and found it to be easier to just go out and spend $3-5 on a new bottle of counter spray or toilet bowl cleaner. But then I would worry that I didn't know what I was actually using and if it was totally safe for my family. And I would be left with extra bottles and packaging to dispose of and it felt a little wasteful. So, I decided if I was going to make my own cleaners at home, I wanted to do it as simply as possible. I searched high and low for recipes containing three or fewer ingredients, and if I couldn't find a recipe, I experimented until I came up with one I liked. I tried different methods and portions and tested many of the recipes on multiple surfaces for overall cleanliness and streaking.... I am really happy with where I have landed on my homemade cleaning journey, and even more happy to be updating all of you! 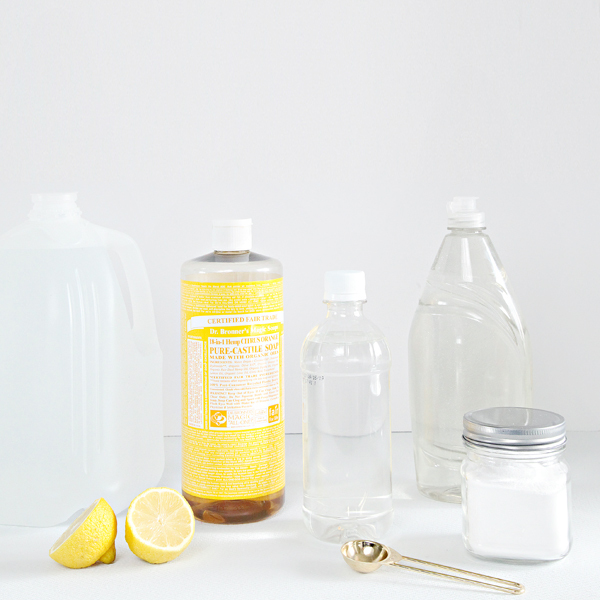 I really hope that those of you who have been on the fence about homemade cleaners will find some inspiration and feel a little more eager to try it out. The best part is that there is very little to lose. The cost of many of the ingredients needed to make these cleaners is quite low, and even better, many of the products last through multiple batches. I have a cabinet in my laundry room dedicated to holding my bulkier ingredient items, such as large bottles of vinegar, distilled water, boxes of baking soda and items for making my own laundry soap. By having a place to store all of the ingredients together, I am able to quickly whip up a new batch and also purchase these ingredients in larger, less expensive quantities. 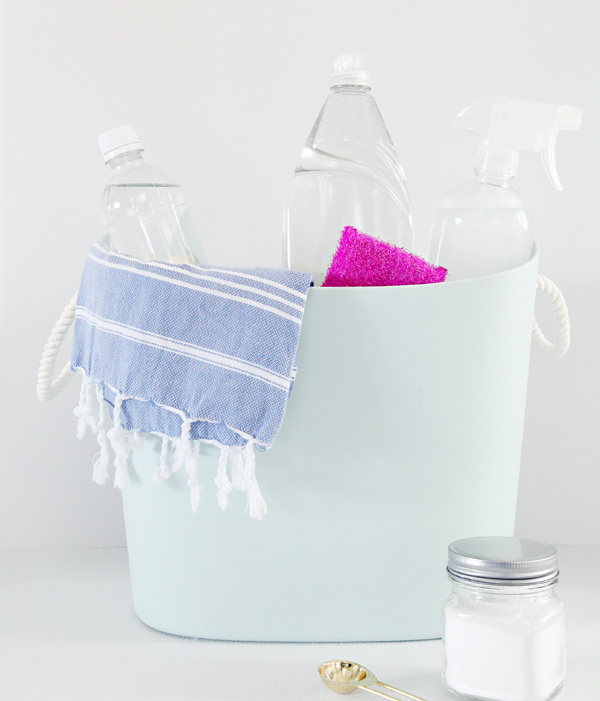 If you are just starting out, many general cleaners can be made with very basic ingredients. VINEGAR // Vinegar is great for cleaning because it actually has the power to clean up messes and dirt and contains some disinfecting properties. It doesn't streak, dries scentless, and is even more powerful when paired with baking soda. DISH SOAP // Yep! You trust it to clean your dishes, why wouldn't it be great for counters, floors and the shower too? A little goes a long way and it can tackle quite a few jobs! BAKING SODA // Whenever I need a little extra scrubbing power, I reach for the baking soda. And it becomes even more beneficial when mixed with additional ingredients. For example, next time you have an awful dish or pan to wash, sprinkle it with a little baking soda and add some dish soap and hot water. Let it soak for 10-20 minutes and the end result is pure magic. 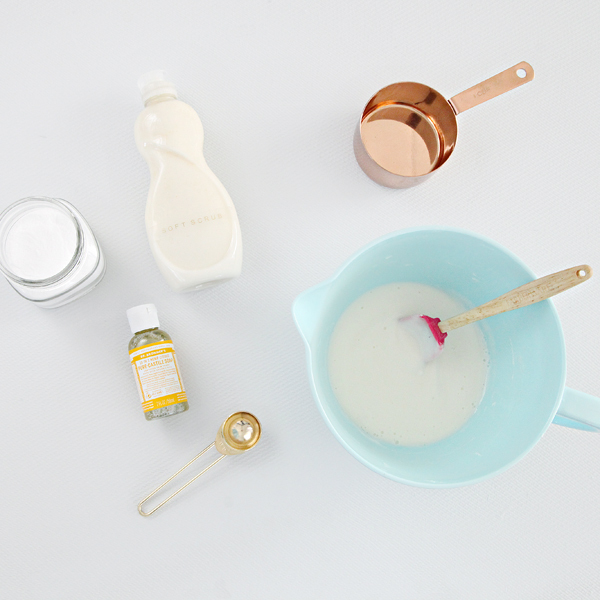 So far you are able to create quite a few cleaners with products that are extremely inexpensive. But if you are looking for the true powerhouse item, add Castile Soap to your list. CASTILE SOAP // This soap is extremely concentrated, but it is also a really great cleaner and degreaser. Simply pair it with distilled water and it can take on your toughest jobs. I especially love it for cleaning my stove/oven and also for tackling dirty doors and trim. (Castile Soap can be found at many Natural Food Stores, Target and Amazon. It seems more expensive than traditional soaps and cleaners, but a very small amount contains mega amounts of power. A single bottle will last a very long time, and it can also be purchased in travel sizes so you can give it a try with little risk or investment). Now that you have the ingredients to conquer 90% of your jobs, there are a few additional items that take things even further and can aid in creating a some really effective specialty cleaners. WITCHES HAZEL // Safe enough to be used on your skin but also a natural deodorizer. RUBBING ALCOHOL // Dries ridiculously fast and streakless with disinfecting properties. It is also an amazing stain remover. 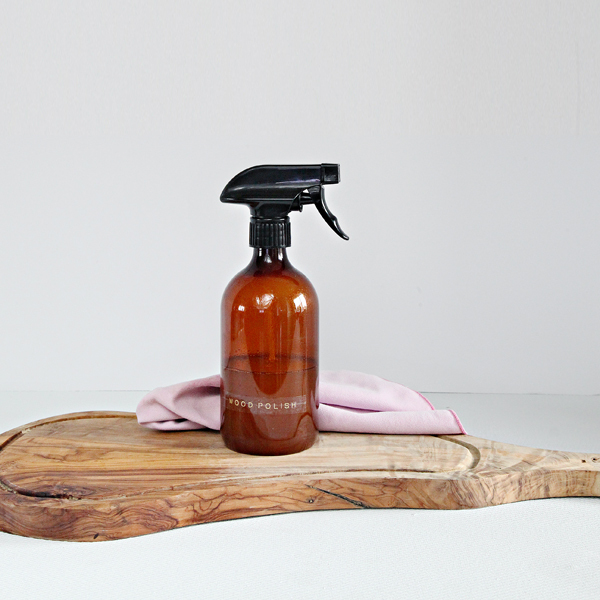 OLIVE OIL // A natural way to treat wood finishes and can also be used to polish stainless steel. HYDROGEN PEROXIDE // A natural whitener. LEMON JUICE // Smells amazing and has a lot of cleaning power; a great booster when whitening and cleaning bathroom finishes. 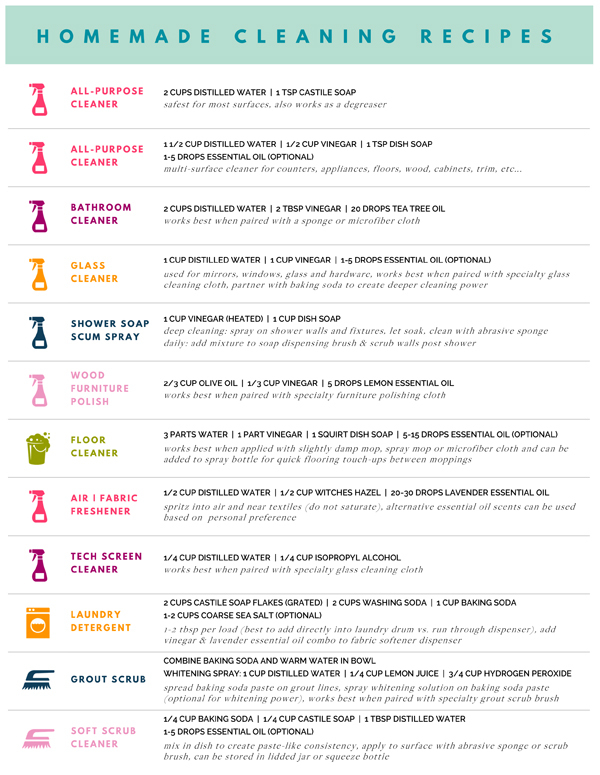 Essential oils are not crucial for effective cleaning, but they do have a lot of positive qualities and there are three I find myself reaching for over and over and over. LAVENDER // Added to a baking soda shaker and sprinkled on our mattresses, it not only deodorizes but leaves behind a soft, sleepy scent. I also add this scented oil to my fabric softener and room freshening spray. LEMON // Let's face it, lemons have a super-mega-clean aroma. I use this essential oil with the majority of my cleaners because it smells so fresh and also cuts down on the vinegar scent. TEA TREE // Tea tree oil is a natural and safe disinfectent. Adding this oil to cleaners helps to remove unwanted bacteria, making it ideal for cleaning germy areas like bathrooms. 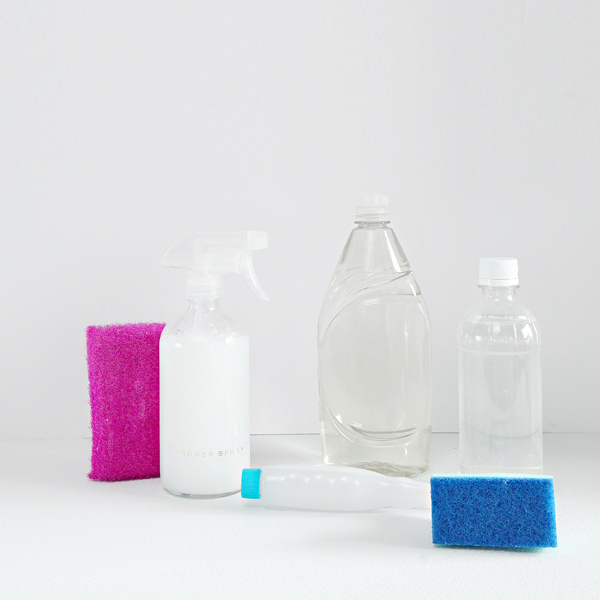 You don't need much to make your own cleaners, but there are a few items that are helpful in making the process quick and effective. MEASURING CUPS & SPOONS // For the most part I tend to eyeball or get my measurements close, it really doesn't have to be an exact science. But there are times when I do like to keep my portions just right and find it helpful to utilize measuring tools. MIXING BOWL // A few of my favorite recipes work better as a scrub or paste that I like to mix in a bowl first and then transfer to the final container. Additional recipes require heat so a bowl is also helpful in heating the ingredient(s) prior to mixing. 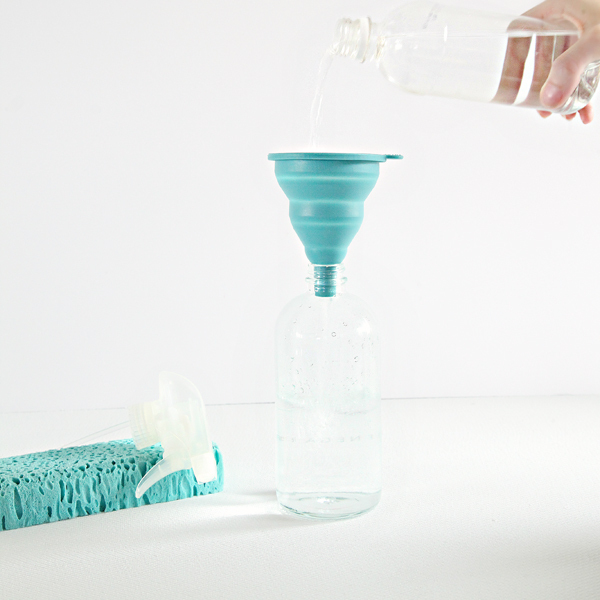 FUNNEL // A funnel is extremely handy for pouring the ingredients into spray bottles; I especially prefer a collapsible funnel because it can be stored right inside my cleaning caddy. 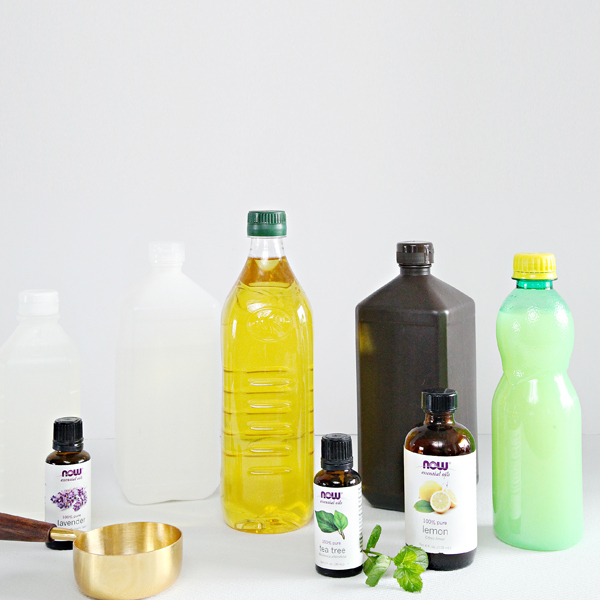 SPRAY BOTTLES // You can utilize the empty cleaning bottles from your past purchases, but if you plan on permanently switching to homemade cleaners I recommend also switching to glass spray bottles. Plastic bottles can break down over time and seep into your cleaners, especially when paired with a few specific ingredients, but glass will stand the test of time. 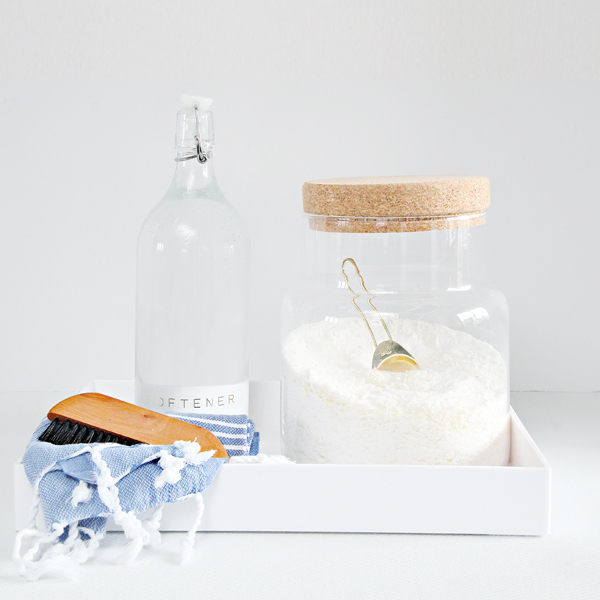 SHAKER // Using a shaker for your baking soda makes it easier to store under a sink or in a caddy, and is also easier to control the quantity being used when sprinkling it into sinks, toilets and even on carpets and mattresses. 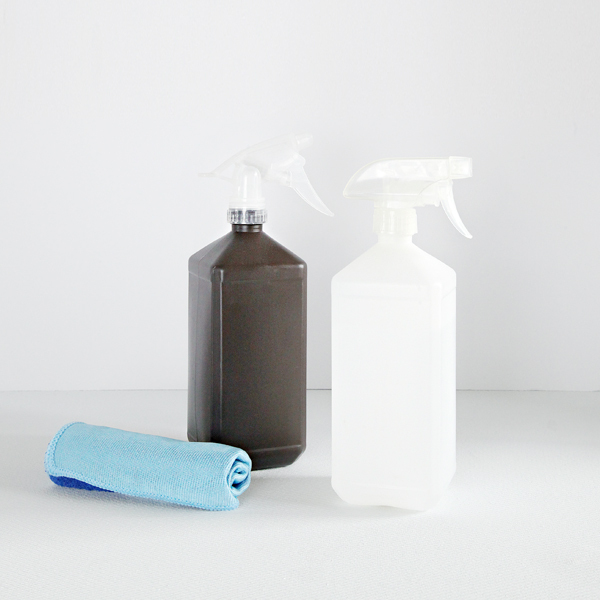 Quick Tip: You can add a bottle sprayer directly onto your Peroxide and Rubbing Alcohol bottles. This allows you to utilize them quickly for those on-demand tasks. Works great for cleaning just about anything and is also a wonderful degreaser. I especially prefer this mix for cleaning my oven, stovetop, trim and doors. It is also safe to be used on most surface types. This is my "go to" all purpose cleaner for any quick cleaning task; especially counters, tables, and floors. This was actually my newest floor cleaning recipe, and when I saw it left my floors streak-free, I figured why not use it for everything? Vinegar may not be safe for all surfaces (some stones specifically), which is why I wanted to offer the above option as well. I do find that if too much Castile Soap is used in the first recipe, it may create a slight haze or some streaking, so I do prefer this version to the other for my primary surfaces. A great cleaner with disinfecting qualities. Works best when paired with a sponge or microfiber cloth. This recipe not only works great on glass, mirrors and windows, but it will also leave your fixtures and hardware shining and streak-free. Works best when paired with a specialty glass cleaning cloth. You can also pair this spray with baking soda to clean bathroom toilets and kitchen sinks. Heat the vinegar in the microwave and then add dish soap. The heat helps the dish soap to quickly combine with the vinegar (and it won't separate even after being stored for some time). Saturate shower walls and doors and let sit, or soak items containing soap scum in a bucket with this mixture. Wipe down shower with an abrasive sponge for optimal results (should remove soap scum with ease). To maintain a clean shower, add mixture to a dish wand and use every couple of days post shower. Use to bring back the grain and finish to wood accessories and furniture. Works best when paired with specialty polishing cloth. Above you can see the oiled area on the left and the un-oiled area on the right. I use this on my wooden utensils and handles, cutting boards and wood furniture pieces. I also trust that it is food-safe because of the ingredients. 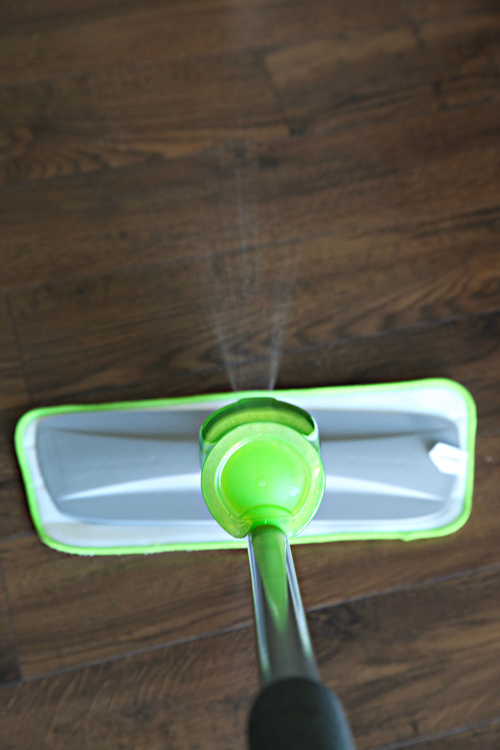 Can be used on most flooring types and will leave your floors clean and streak free. Works best when paired with a dry or slightly damp mop or microfiber cloth. As I mentioned above, I also added this recipe to a spray bottle for everyday cleaning of most surfaces, and also for spot cleaning our floors in between moppings. This mixture can be added to spray mops or used in a bucket (again, I find it works best when the floor isn't overly saturated so wring your mop well). The witches hazel is a natural odor neutralizer while the water and essential oil add a pleasant aroma to the room. Lightly spritz around the room and near textiles, just be sure not to completely saturate any surfaces. Although vinegar leaves 99% of my surfaces streak free, it didn't have the same effect on my tech screens. I can only guess that it may be the heat of the screens paired with the dry time of vinegar that left my screens quite streaky. Swapping the vinegar for rubbing alcohol did the trick, and leaves my screens crystal clear! This recipe is quite similar to one I had been using for years, but it is slightly modified to be even safer. My previous recipe called for Borax, and although it is a natural ingredient, there are debates that it may be toxic and harmful. However, Borax is frequently found in many cleaning recipes, especially laundry detergents. After some research and testing, I found that swapping the Borax for Baking Soda yielded the same results. I also switched from using Fels-Naptha to a straight Castile Soap bar. I can get four cups of grated flakes from a single bar, so I double this recipe each time I make it (every few months). Finally, we have hard water and the salt helps to combat that. You can make a scented softener out of coarse sea salt and essential oils, or just add the salt directly into your detergent recipe. Be leery of using Epsom salt as a softener (as some recipes suggest), as it technically isn't salt at all and can actually make your water harder. I find it works best and is easiest on our HE washing machine to add 1-2 tablespoons of the powder directly to the washer drum with the clothing/linens. I then run the scented vinegar through the fabric softener dispenser. Our clothes come out soft, fresh and clean (with zero vinegar scent). I store the softener in this bottle and the detergent in this container. Mix in a bowl to create a paste consistency (may need to add more baking soda to thicken). Store in a squeeze bottle or lidded jar (I used an old dish soap bottle). Works best when paired with an abrasive sponge or scrub brush. Spread Baking Soda paste into grout lines. For whitening power, spray lemon/peroxide mixture onto paste and let sit. Scrub lines with heavy duty bristle or grout brush. Wipe clean with water and dry microfiber cloth. See more in this post here. That was A LOT of information, but hopefully it was easy to understand and feels doable! My younger kids love to help make these recipes (it is almost like baking and science combined), and I have also convinced quite a few friends to move to the homemade cleaning side as well. You can do it! 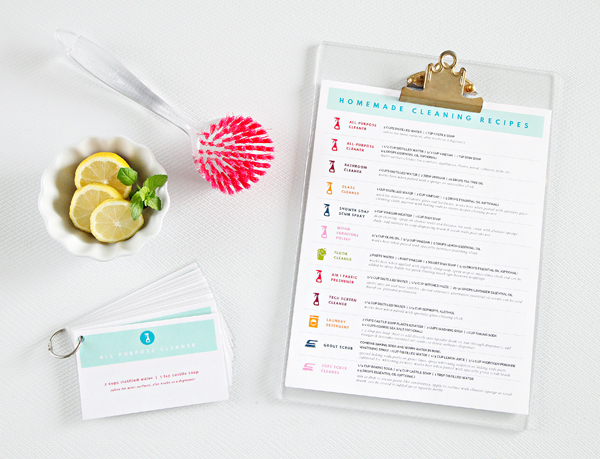 But to make it even easier, I created two different printables that contain all of the recipes above. I keep these recipe printables in two locations. I laminated the larger chart and store it with my bulk cleaning ingredients in our laundry room. I also printed the recipes on 3x5" blank index cards, which I laminated and placed on a binder ring. The cards conveniently tuck right into my cleaning caddy. Raise your hand and comment below if you are feeling inspired and excited to give this a try! 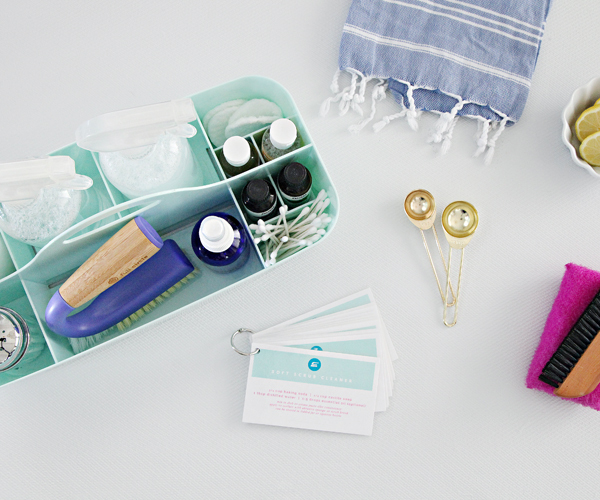 And don't be afraid to start small and grow your homemade cleaning products and skills. Start with a simple counter or floor cleaner and expand from there. Not only do the cleaners work, you will know exactly what you are cleaning with and what you are being exposed to. It is oddly satisfying to mix up a batch of something and watch it work just as well as something much more costly. And last but not least, I recently discovered a couple of resources that will help you determine which products are safest to use in regards to your cleaning and beauty routines. I was both relieved and shocked to find these sites and will definitely be checking on our personal care products in both areas frequently. Just go to either of the sites below, enter your product in the search bar and click the item that matches. You will then see ratings and information in regards to the product and its overall safeness. Looking for more product details? 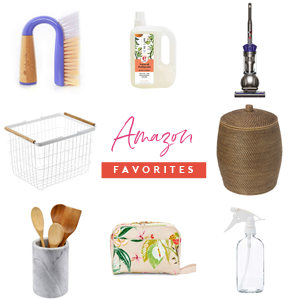 Check out my favorite cleaning supplies and tools here. Thanks for the tips and recipes! What is the difference between using distilled water vs tap water? You just never know what you are going to get with tap water, and it may contain minerals that impact the overall performance of the recipe. For the most part it is probably fine, but I just prefer to use something I know to be pure and won't scale up to clog my sprayer. Thank you very much. I have never thought about making my own cleaning products before. Time is at a minimum for me but I think I might just give some of these a try! Thank you for this information and the printable, I plan on giving some of these a try. I spent half my day yesterday looking up recipes! This is the most perfect timing ever! I was trying to figure out where to store everything since I have a tiny house and minimal storage. I was planning to start with making laundry detergent this weekend, but have been on the fence between powder and liquid. I DO NOT want or need to keep 5 gallons of liquid detergent on hand! This is way better. Just worried about the powder dissolving. Super inspired to organize my laundry room and get started with this! Wow. This is a great resource. I've been just starting to make my own all purpose and floor cleaners, but will try using the castille soap. I also really want to try the soft and grout scrub recipes. Thank you so much for the printable as well. Thank you for a simple resource like this! I'm so much more comfortable keeping these kinds of cleaners around my house--since I have curious pets. Thank you for posting these and for the printable! Also, I love that blue batter bowl and would love to know where you got it. What a great post! I have been moving towards making my own cleaners as an attempt to reduce my plastic consumption and it's nice to know there are no chemicals in my home. One word of caution about using olive oil as a wood polish for food related items like cutting boards - olive oil can actually go rancid with prolonged exposure to air. I use mineral oil instead, which is food safe and works great! In Australia mineral oil is called 'liquid paraffin' and you can get it at most chemists and some supermarkets! How much fabric softener do you use per load or are you making the full two cups of vinegar/oil for a single load? The recipe is what I store in the bottle (I actually double/triple it to fill it entirely). When running a load of laundry I just add it to my dispenser to the "fill" line (so what you would normally add to a load with traditional fabric softener). I don't mean to sound stupid, but what kind of grater do you use for the castile soap? The standard 4-sided one? What size holes? Do you keep a grater just for making laundry soap? These recipes look great, and so much less expensive than commercial ones. Great question! I use a standard grater and keep it with my laundry making essentials for that purpose only. The goal is to grate the soap as finely as possible. Some individuals utilize a food processor for this step but I never have (don't want to risk gooping it up). Only you can make cleaning products look absolutely beautiful!!!! These are SO helpful! One question: What do you use in your dishwasher? I hate keeping those toxic pods around, but I haven't found anything else that cleans the dishes as well. Hi Tara! I still use whatever "green" version is the cheapest at the grocery store. I haven't ventured into making my own yet, but I agree, nothing seems to clean quite as good as some of the not-so-green options. I do find it helpful to add some Honest rinse aid to my dishwasher though. I will be sure to update you all if I do find something super easy and effective for the dishwasher. 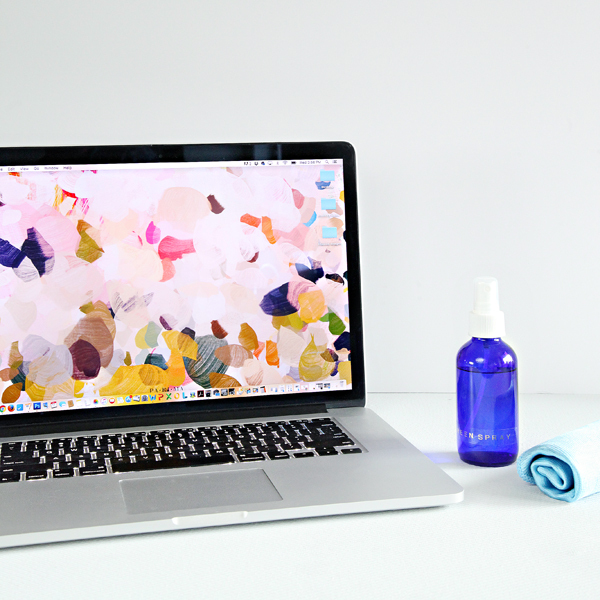 Could you share where you got the cute desktop wallpaper featured in this post? Great post! I've heard (baking) soda is bad for your washing machine. Does anyone know if this is true? I do see it in a lot of homemade washing detergent recipes. I am highly suspicious of the cleaning advice from anyone whose still impressed by the reaction between vinegar and baking soda which, when combined, just becomes worthless much that some elbow grease and a regular rag could easily make. There's also been a number of studies indicating that, while vinegar has some disinfectant properties, it's hardly better at water in lifting away dirt. Diluting soap also reduces its efficacy, from preventing the particles from being able to grab particles like dander and dirt to making it quickly go rancid, so why not just use a tiny drop of castile nd some elbow grease, and stop buying extra plastic spray bottles and squirt containers to house poorly conceived cleaning products in the name of natural, minimalist or earth friendly materials. Yech. ~sincerely, a frustrated environmental science scholar tired of bad home chemistry tests. Thanks for taking the time to share your feedback and reaction. I definitely did not go to school on this specific subject, but I have done a lot of reading and online research, and I have also used the majority of the cleaning recipes for quite some time with amazing results. My house has never looked, felt and smelled cleaner, especially when I compare to the products I was spending a lot of money on at the stores. To clarify a few things... I prefer vinegar to water as I do personally feel it cleans better and leaves less streaking than simply water. I don't rely on it for its disinfecting properties, but turn to specific oils and heat for that. I do find that baking soda also helps in scouring and scrubbing so I will continue to add it to cleaners to do so, as well as use it as a natural deodorizer. In terms of diluting soap, that is my goal for similar reasons. Too much soap becomes sudsy and hard to remove, leaving streaks and film. I also like to keep things pre-made and within reach. Just as soap is diluted in dishwater for washing dishes, I dilute it to clean. Finally, I mentioned in the post that I don't purchase plastic containers, I reuse old containers from other cleaners or purchase the glass bottles. I am a true fan of these recipes and am always amazed at how well they work, and this is my personal space to share those tips and outcomes. Bravo Jen, that was a very gracious reply! Jen. Great post and can't wait to get on the make your own cleaners band wagon. I recently used vinegar and baking soda on my very crusty oven and it worked AH-mazing. This was after hot soapy water and scrubbing did nothing. I let it sit for a few hours and would squirt vinegar a few extra times onto the baking soda to "reactivate". I was delighted at how little effort it took to make my oven shiny again and very proud that I didn't resort to horrible store bought oven cleaners. I am delighted to read this and that you took the time to share. Thanks so much Carolyn! I had to ditch store bought cleaners due to me having anaphylactic reactions from a certain chemical which I still haven't isolated. I've been using vinegar and water but hubby nearly vomits from the smell of vinegar... even when I mix it with orange peel to take away the smell. My friend got me onto Norwex cloths and I love them. For my windows I just wipe the dirt off with a damp cloth and dry with the window cloth and it cleans streak free every single time. I use the kitchen enviro cloth for the benches and pretty much every surface that gets dirty apart from the obvious toilet and floors, apparently there are tests proving it sterilises just as well as chemicals do and completely safe. They aren't the cheapest but they don't get smelly and slimy like other cloths and they do a genuinely good job. Haven't had any experience with the cleaners they sell but they are natural at least so I know I won't die if I give them a try. Hi Jen, I was looking for this post, it's so inspiring. I read your blog for a while and it's one of my fav sites. I love using vinegar and baking soda in my house (I always have "some" of these in my cupboard), but I will upgrade my cleaning supplies after reading this. I also use them for my washing machine some time to time. Ps. I'm waiting for new glass spray bottles (thanks to your previus post), but I had to order them online because they are hard find here in the right size. I have used a few of your recipes for years and really enjoyed them. Our hardwood floor warranty is void if we clean then with vinegar so readers should use caution. Most manufacturers don't recommend using vinegar on hardwood. I just want to thank you for this post and the free printable recipes! Just know they are greatly appreciated by many who want to steer clear of chemicals in their homes. Scholar or no scholar,I know the recipes work because I have already tried a few. My shower is nice and clean without any nasty chemical fumes and I don't have to worry about what they are doing to my lungs. 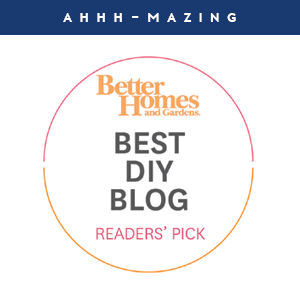 I have been a long time follower of your blog and I love all your diy, decor flair and cleaning tips. Thanks for all your posts and keep up the great work! Ah! Great post! 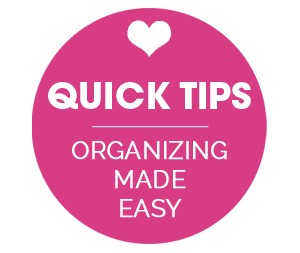 Thank you for sharing your tips and the printables. Having a baby in the house has really spurred me to find safer cleaning methods and I am excited to try your easy to follow methods. Thank you, thank you! Jen, the EWG is amazing and I've been using it for years, as I have really sensitive skin and figured out early on that the cause of a lot of my skin problems are the horrible ingredients in my makeup and personal care items. That extends to my cleaning products as well as I have asthma and am scent sensitive so commercial products led me to spraying cleaner in the bathroom then running out quickly till the smell and any atomized chemicals aired out. They have a petition for people to sign to get laws on the books to get rid of chemicals causing all sorts of healthcare issues and environmental problems. I suggest everyone go to the website to check it out. Also, they have recently developed a program for beauty and personal care items (EWG Verified) for companies to participate in, meaning thier products are made without toxic ingredients. Its easy to forget there are NO regulations to what a company can claims as "natural" among other things. I recommend reading Not Just A Pretty Face:The Ugly Side of the Beauty Industry for those who want to learn more. As for the Scholar reply, I think they assume you are mixing baking soda and vinegar together to clean, as clearly they didn't read your recipes. I have seen many recipes where people have done this, and to that affect, the commenter is correct that it would neutralize each other. As for vinegar, it os not antibacterial but it is antimocrobial. It is scary to a lot of people to not have antibacterial properties in thier cleaners, but studies have shown that using antibacterial cleaners just make super bugs, resistant to those cleaners anyways. Plus they are so toxic to people and the environment. I'll get off my soap box now (ba dum dum) but I also have been using mostly home made cleaning products for years with good success. Keep up the good work and everyone should remember that they are reading a blog, not a professional acedemic paper, and as the reader we have the responsibility to research things we are using in our homes, commercially or home made. May I ask, the desktop background on your laptop - photo above the 'tech screen cleaner' - where would I be able to find it? I think it's beautifull. 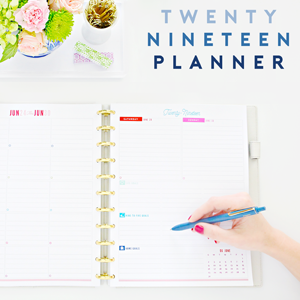 Thank you for this article and the printable! Can any of the cleaners double up and be used to clean stainless steel? 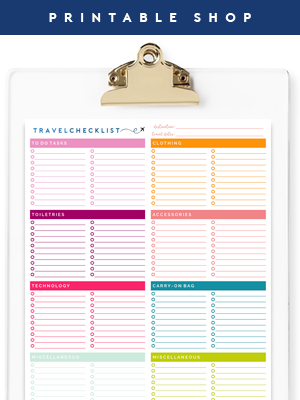 Great post and thanks so much for the printable! Apologies if I missed it, but which label maker and labels are you using? Is that gold?!? :) TIA! Great post! Love the recipes, quick question, what dish soap are you using? I try to stick with Castille to keep it green, but when I used Castille and vinegar in my all purpose cleaner it looked like it separated, maybe it was the plastic bottle breaking down? Anyway I'm curious if there is a greener dish soap option you recommend? I actually prefer Dawn Ultra Free & Clear. I was surprised to find it has the same EWG rating as most "green" dish soaps and haven't found another that cleans as good or has a better rating (other than castile soap, which I prefer to keep as a secondary option). That said, I am thinking of giving the Sals Suds a try as an alternative as I have heard pretty good things: http://amzn.to/2p7XMm9. Also, your air freshener/spray-I believe if you change it to vodka, and do 60% vodka or rubbing alcohol and 40% water, it will act as a disinfectant spray like Lysol. Nice when the kiddos get sick. Thank you for the wonderful post!! I came looking specifically for your homemade recipes and this pops up right away! Thank you so so much for sharing your recipes and printables!!!! Yay! Can't wait to try it!!! Quick question, do you notice any peeling around the edge of your mirrors from using vinegar to clean? My mom said she used water and vinegar to clean but started noticing it was damaging the mirrors. Just curious if you'd ever experienced that? Thanks Jen! !😘😍 love your blog!!! Interesting! I have never hear that before, and I haven't personally experienced that with any of my glass or mirrors over the years (and I have been cleaning with vinegar on my glass for quite some time now). I wonder if it has anything to do with the application process. I would love for others to chime in on this one and share if they have had a similar experience. Thank you! This is amazing. Have been wanting to do this for awhile now to save some money and also just had a baby so I will feel better using natural products on surfaces he will touch. Wow! Thanks for putting together such a comprehensive compilation. It will be a great resource as I'm ready to venture beyond homemade laundry detergent. Thank you for this great resource! I've made a few home cleaners before so im excited to try more listed here! https://www.premiumvials.com/16-oz-amber-boston-round-glass-bottle-w-power-trigger-sprayer/ . Less than $5 for two bottles, not $12 that the seller is charging! I found spray nozzles and other bottles in other sizes too! Thank you so much for the amazing tips and recipes!